December 11, 2018 Jimmy has been moved from FCI Greenville in Illinois to FMC Lexington in Kentucky. 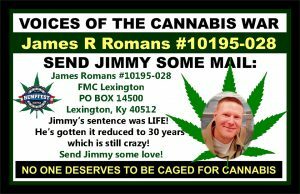 Jimmy’s new mailing address is: James Romans #10195028 FMC Lexington PO BOX 14500 Lexington, Ky 40512. Jimmy loves getting mail. It really lifts his spirits! Remember that all cards and mail needs to come in white envelopes now! My post cards seem to continue to make it through to him though! Thank you!!! September 14, 2018 We are helping Jimmy’s family with an awareness day targeting President Trump who we sent 1,000 letters to just after Hempfest this year. Let’s hope our awareness campaign gets his attention and he reviews Jimmy’s case! 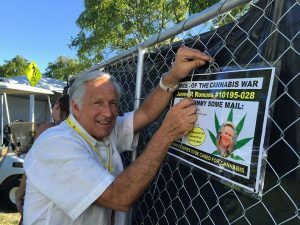 August 7, 2018 The phone rang at Hempfest Central today and it was Jimmy Romans calling from the Greenville Federal Prison in Illinois. We chatted about our letter writing campaign that Kristen Flor is championing. Kristen’s own father, who ran a state legal medical cannabis store in Montana, died chained to a bed while in Federal custody on charges for running this store. We chatted about how excited I am for Natalie DePriest to be at Hempfest this year. Natalie and her brother are co defendants in a case where 12 plants got them each 15 years. Her brother David is still in prison. Part of their prosecution also requires that that two co defendants have no further contact. They are siblings! A family is destroyed by this! Jimmy loved hearing how George Martorano will be producing the Atlantic City Hempfest next year! Having one of our released prisoners actually carry on our legacy on the east coast is an emotional win and extraordinary experience as someone who has put her heart into helping those the drug war has harmed. Jimmy always asks how we are doing and shares his overwhelming gratitude for all that we do. Thank you everyone who has signed a card or letter, bought a raffle ticket, or written to Jimmy. We are making a difference and we are not giving up until Jimmy and all the cannabis prisoners are set free! 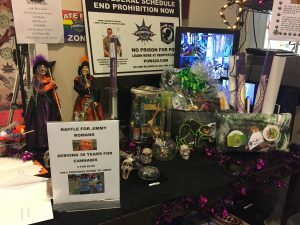 Remember to visit the 420 POW area in booth 491 on the side of Stone Village that faces the bridge. Sign a letter for Jimmy and for all the other prisoners they are representing. We will win this war! On July 25, 2017 Jimmy was granted a reduction in the term of imprisonment based on a sentencing guideline range that had been lowered since his original sentencing. His sentence is now 360 months which means with good time he will be out in 18 years! I’m sitting here doing the happy dance for 18 years, which seems crazy, but hey – it’s not life without parole! Jimmy has a new attorney who is willing to work pro bono on a new appeal targeted on things his original attorney should have done, but did not. This could reduce his sentence even more! He was also transferred to a medium security prison which is great as he’s not locked in his cell the majority of the time and has more opportunities to better himself and positively use his time. We are not giving up! 2035 is a long way away! March 2016: I love it when the phone rings and it’s Jimmy Romans on the other end. He called us to thank us for the Winterfest Member’s raffle donation of $300. He also let us know he has a new attorney who is willing to work pro bono on a new appeal targeted on things his original attorney should have done but did not. It’s crazy to understand that you can be two weeks away from completing a state sentence of 15 months and have it turned into life in Federal Prison! Think about that. That’s our tax dollars at works folks! Jimmy, his family, & Seattle Hempfest thanks you for helping!! Who is Jimmy and what’s going on here? 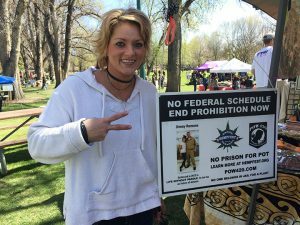 Seattle Hempfest has also adopted James Romans, a man serving life in prison. In February of 2013 my brother was sentenced to LIFE for conspiracy to distribute Marijuana. The case # is CAUSE NO. 4:11-CR-127.6. Prior to this conviction, my brother has never had any violent cases. He had been raised, and was currently living in Indianapolis, Indiana. Approximately 1.5 years prior to his sentencing he was on a work release program getting his life on track, he had 2 weeks remaining of his program before he would successfully complete it, along with holding down a job. It was then that the Federal Drug Taskforce came to his home, took him from his home and transported him down to Dallas Texas, where he has never lived. They also transported approx. 15 other gentlemen from the State of Indiana down to Texas. My brother was taken away from all his friends, and all of his family. He did not understand what was going on, only to find out the Federal Government had taken his state case, and turned it into a Federal Case, the State case which he was almost finished serving. The Federal Government did not catch my brother with any marijuana on him, nor did they see him conduct any transactions. The entire case is based upon hearsay from other individuals. My brother has never been a snitch, so for this case, he would not speak, or make up stories regarding other people. Once the case was heard, my brother was sentenced to LIFE in prison. While the individuals that were “supposedly” higher in this case, were only presented with 12 years. This is completely wrong, and unjust. My brother’s case is currently in the 5th district court of appeals in Louisiana, waiting to be heard. He has a court appointed lawyer whom we have not had much cooperation with. We are asking for all the hel p that we can get. 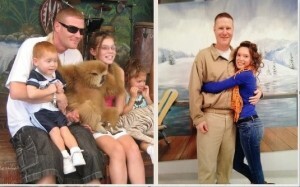 My brother has 3 amazing children who he LOVES and adored and spent the majority of his time with prior to this case. He has NEVER been a violent person, does not have ANY convictions for being a violent person, he has NEVER lived in the state of Texas, nor “conducted transactions” (As the case states) in the State of Texas. Although, I am not saying that a charge of conspiracy to distribute does not warrant some type of jail time, I do not believe that it warrants a LIFE in prison sentence. My brother was given longer sentences than MURDERS and CHILD PREDATORS! This type of sentencing MUST STOP in our courts today! 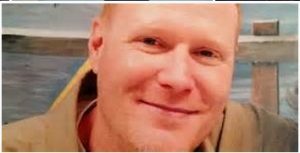 Please sign my petition asking the 5th district court of appeals to hear my brother’s case and provide a clemency, or shorter sentence. Please feel free to review my brother’s case as well to understand the details. I thank you very much for taking the time to read this. 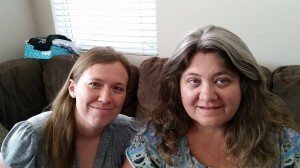 I was fortunate enough to meet Elizabeth, Jimmy’s sister on my recent trip to California.